Cross-posted on the EA Forum. Fish can be stocked when they are anywhere between the egg stage and multiple years old. The mean time spent in hatcheries/farms seems to be somewhere between 6 days and 4 months. Fish stocked to enhance recreational fisheries tend to be released when they are older than those stocked to enhance commercial fisheries. The number of stocked fish (35-150 billion) is comparable with an estimated 75 billion farmed land animals (FAO, 2017 data), and 48-160 billion farmed fish that are slaughtered for meat every year. However, fish farmed for food generally stay in farms longer than fish raised for stocking. Many stocked fish are released when they are less than five days old. Furthermore, it seems that many more fish juveniles are raised to be stocked in aquaculture systems (see the appendix). Enger (2014) claims that 350 million small fish are stocked into Minnesota's lakes every year. It also states that “the vast majority of those are walleye fry, two- or three-day-old fish.” This video also shows that walleye are stocked soon after hatching. I don’t have the expertise required to review fish welfare in depth. 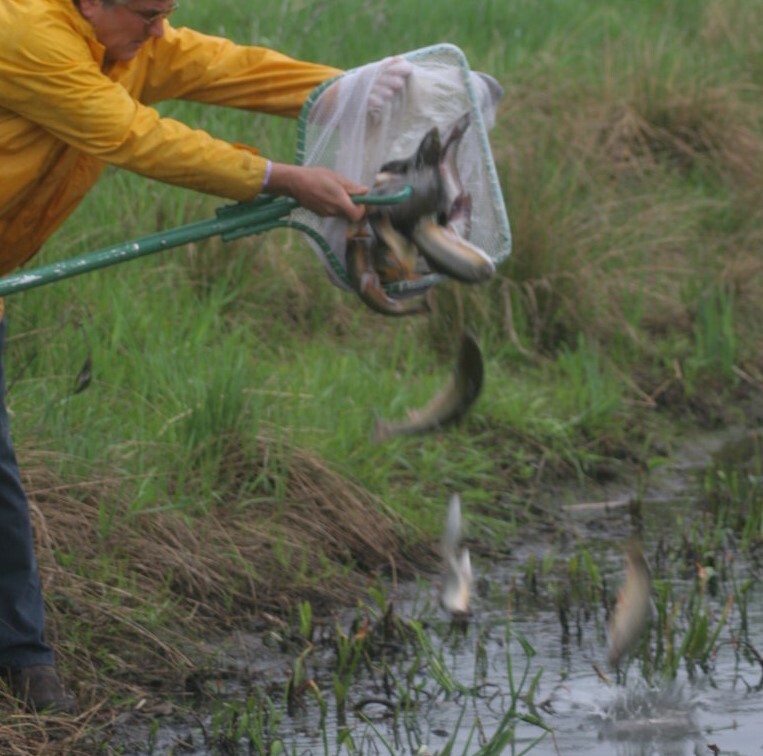 Superficially, videos of U.S. sport fish hatcheries suggest that conditions are not good. In many cases, fish seem to be overcrowded, and no environmental enrichment can be seen. Furthermore, many of the fish stocked in California, Alaska, British Columbia, and probably many other places are triploid (with three complete sets of chromosomes instead of the typical two) to protect the genetic integrity of wild fish populations. According to Greig (2019, forthcoming), all these factors can be bad for fish welfare. We also see in videos that there are multiple changes in the environment in hatcheries that may cause fish stress, especially during the transportation and stocking. Some fish are transported in backpacks or thrown to lakes from airplanes and helicopters. Urness (2017) mentions that about 95% of trout fingerlings survive the fall from a helicopter. It’s also possible that many fish are injured by the fall. What is more, according to Brown and Day (2002), “there is a large body of evidence showing that transportation has a significant effect on the stress levels of hatchery fish.” Finally, there is suffering involved in the collection of eggs (e.g., see this video), although it has to be endured by relatively few individuals. I am confused about what some of these big numbers are. I think they are the numbers of juveniles produced for aquaculture. But if they are, it’s unclear why these numbers of juveniles produced by India and especially by China are so much higher than estimates of slaughtered farmed fish. I’m not sure if pre-slaughter mortality rates can explain it. According to Greig (2019, forthcoming), “pre-slaughter mortality rates for some of the most commonly farmed fishes range from approximately 15%–80% over the entire production cycle” and “the mortality rates may be quite high in very young fishes and much lower as fishes approach slaughter.” Since hatchery-produced juveniles are already past the first stage of their lives in which pre-slaughter mortality is the highest, mortality during the grow-out period shouldn’t be that high. It could also be that the number of farmed fish that are slaughtered is higher than is estimated, but I would be surprised if it was that much higher. I think this question should be investigated further. According to the report, fish stocking interventions may be less promising because the industry is on the decline. 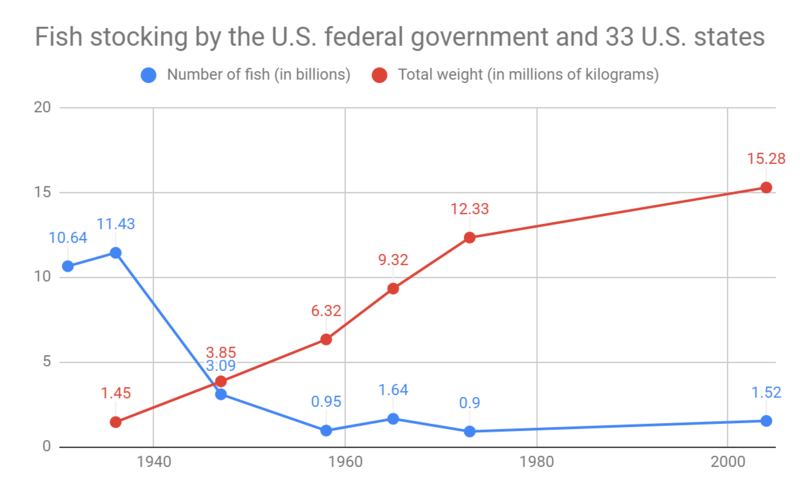 The main cited evidence for the decline is the claim in Halverson (2008) that in the U.S., "based on the data from the federal government and the 33 states for which data was available in all years, it appears that the total number of fish stocked in the 1930s was about 7 times higher than in 2004." I think that figures of the 1930s are not very relevant for determining the current trends. The graph in the trends section of this article suggests that the numbers stopped declining in the 1950s. Furthermore, Halverson (2008) also claims that the total weight of the stocked fish in the U.S. has increased dramatically since the 1930s. Finally, this evidence is only from one country and ignores much of the stocked salmon. Overall, my research in this article weakly suggests that the number of stocked fish is more likely to be increasing than decreasing. Finally, fish stocking seems likely to remain very big in scale even if it is declining. Some animal rights activists are against many of the changes that the animal welfare movement is campaigning for. They argue that these changes can be counterproductive in the long term because they send the message that treating animals as property can be acceptable. This sometimes leads to infighting which can reduce the legitimacy of animal advocacy as the whole. For example, PETA opposed California's Prop 12 which demanded better conditions for farmed animals. Furthermore, the opposition to Prop 12 was entirely funded by a nominally farm-animal protection organization (HFA) which claimed that Prop 12 is bad for animals. HSUS accused HFA of misinformation. Preventing such infighting is one of the reasons why it’s preferable to focus on interventions that are good from both, Animal Rights and Animal Welfare perspectives. Greig, K. 2019. Improving Farmed Fish Welfare. Animal Charity Evaluators. Forthcoming. Leung, P., Lee, C. S., O'Bryen, P. J.. 2007. Species and system selection for sustainable aquaculture. John Wiley & Sons. Smoker, W. W., Heard, W. R. 2007. Productivity of Alaska's Salmon Hatchery Ocean Ranching Program and Management of Biological Risks to Wild Pacific Salmon. In Ecological and Genetic Implications of Aquaculture Activities (pp. 361-381). Springer, Dordrecht.